ABS Season 2 Finale: Results! It's been quite the journey these past few weeks. 19 competitors built for the season 2 finale of the ABS Builder Challenge. A total of 80 creations were made during the 3-week timeline. There were lots of amazing uses of the silver goblet piece, and we're excited to share the results with you! We also asked the competitors to provide some insight into the creations that they built, so we've included their responses (those who had a chance to) below the detailed breakdown of the results. As a reminder about how the scoring works, only the top 18 creations (at least 1 from each member) from each corner house (team) are included in the house's final score The house with the highest score wins. There is also a champion award which goes to the person who contributed the most to his house's score relative to the top contributor of the other houses. Without further ado, the winning house for Season 2 Finale of ABS Builder Challenge is Azure Blue! The Champion title of the Season 2 Finale goes to Mark Erickson who contributed 904 points to his house, Dark Orange. Detailed below are the scores from the other houses and top contributors for the teams. Below are the score breakdowns of the top contributors for each corner house. We asked the competitors to pick one of their creations that they entered into this competition and to explain some of their thought and build process for them. Here is how they responded, it is definitely worth the read! Noel Peterson - The Bane of Castle. I think the best build of mine from this round was the castle wall. I was pretty proud of the cannon idea and I really liked the texturing on the wall, however, I probably should have taken more time figuring out how to present it. Ultimately though, this round was a bit of a flop for me. I’d been out of the loop for a while and my building wasn’t really on point. Carter Witz - Synth. I'd been brainstorming for ideas when I saw a cord lying around and thought I might be able to use the goblet as part of a cord. Then the idea of making a synth popped into my mind. Which also gave me the chance to use the goblet as buttons and knobs on the synth. For the first couple days I was working on making the keys and getting them spaced correctly. But after that it came together pretty quickly. In the end I think it turned out really good. Forlorn Empire - Fly. My first build of the round was inspired in a strange way. Due to a previously planned trip to Mexico, I was unable to participate in the first week of the contest, so when I got back a lot of the great ideas for the goblet were used already. But while I was in Mexico, there were a lot of flies around, constantly landing on me, and sticking their little mouths out. That is where I got the idea, and I built the body to scale with the goblet as the mouth. The color scheme worked out pretty good, with the silver and black. Also, bonus note, the wings on the fly were made possible by an accidental double inclusion of the wing sheet from a set! Thanks, Lego! Anyway, absolutely loved this round. Good job to everyone! Michael the Builder - Typewriter!. Certainly my favorite of my builds from this round (mostly due to lack of source material :P) would have to be my typewriter. I got the idea of using the seed part as typewriter keys quite early on in the round, though actually building it was more difficult than expected, mostly because of trying to make the scale of the model as realistic and consistent as possible. While I am quite happy with how it turned out, it would have also been nice to build a larger scene to go with the actual typewriter. Aaron Newman - The Tale of the Three Brothers. Between the time I had the idea for the build and its final execution, I ditched a purely black and white concept in favor of grayscale plus a few muted colors. This change was precipitated by both not having any good vegetation parts in greys, and by my wanting to avoid having a grey background, which I felt would have robbed the final presentation of some of its panache. As such I opted to include the earthy, somewhat noxious-feeling combination of olive green and dark tan. Brown got its place out of necessityI needed it for the bridge's hand railsbut I think it works with everything else so I don't mind it too much. For me, the real star of the show here is my skeletal version of Death. When I first envisioned the build, I actually imagined three separate vignettes, one for each brother, each with a pair of disembodied skeletal hands floating symbolically above them holding their particular Hallow. When I realized I could compress the vignettes into one, a full version of Death seemed appropriate. Garmadon - DSLR Camera and Tripod. I'm not exactly sure when I got my camera idea, but sometime during the round I stuck it on my list of possible builds thinking that the upper side could work really well as a camera's lens. When I decided to try out the idea it as my next build, though, the problem of hiding away the back end and capturing the shape of a camera at that size almost induced me to give up - and a search for other LEGO camera MOCs wasn't very encouraging. Everything was either smaller (using the LEGO camera piece) or way larger than what I had in mind. Once I'd actually starting fiddling around with the parts though it came together surprisingly quickly - first a light grey version which was quickly swapped out for dark grey. I had a couple of sticker sheets laying around, and I think those really helped sell the camera look. The tripod was a pretty fast addition (and I managed to use the aeroblade center piece, woot! ), and although it certainly didn't end up being a super sturdy build, I think it ended up being one of my best and most convincing uses of the part! Classical Bricks - A Luxurious Residence. One of my favorite creations from this round was my last build- "A Luxurious Residence". The idea for the build was mainly sparked by the half round 1x4 tan wheel piece, which I recently got a bunch of. I started with the arches at the bottom, which I think added a fun little architectural detail, and then built the rest of the ground floor. I tried to incorporate some SNOT sections and log bricks in the walls to add a little texture, though I didn't want too much texture. The main doors were where I first used the seed part, which I think worked quite well as fancy door handles, though it took some experimenting to find what which orientation and position would look best. I next had the idea to include a small balcony using the seed part as a railing. If you look closely, you'll notice that every other cup is upside down; I really liked the pattern this created. The rest of the second floor came together quickly, as well as the roof. The one last use of the part was as a drainage pipe on the far right of the building under the roof. If I had more time, I would have improved this use a little as right now I'm not quite happy with it, but it is what it is. I built the road last, which I decided to put at a slight angle to make it a little more interesting. Finally I finished up the building by adding some olive green leaves on the walls. Overall I think the build turned out well for a one-day speedbuild. The Brick Ninja - Death Mace. While probably not my favorite build of the contest, the build that I am going to talk about is my manga style build entitled "Death Mace." First off the idea originally came a few weeks prior when I had been watching the anime Sword Art Online and I thought it'd be fun to try to do an anime or manga style build. The name and primary quote for the build are taken from the introduction of the villain, Death Gun, in the show. In the back of my mind I was thinking the ABS season final might be a good opportunity to do this build, depending upon if I found a way to utilize whatever the piece was. Initially when I saw the piece, when the contest started, I was thinking I would use it as detailing in the wall of a dungeon boss fight. However later I was thinking it would be interesting to try to use the piece as part of a floor. I came up with the idea of using only cups for the floor and quickly realized that that was going to take a ridiculous amount of the cups. The figures were the most time-consuming part of the build itself, with the wall and floor ultimately being rather straightforward. However the work put into the presentation was probably 10 or 20 times longer than the build time. I built the back wall and figured out where I wanted all the figures. I only had enough cups to build an 8x8 section of the floor. So I set it on the baseplate, took a picture, moved it over 8 studs, took another picture, moved it over another 8 studs and repeated the process. Each time when necessary adding in the figures that would be standing in the respective spots. In Photoshop I then combined over 20 pictures including all of the floor movements and the individually lit up flames. I also took a few close-up shots of the figures to be able to get the manga page layout. I drop them all into one file and crop them and put white borders around everything. Put in some Japanese text and saved the file. I was a little saddened that no one ever asked the important question and that was, "What does the Japanese say?" Well I'm far from certain that I got it right but as best as I could tell from looking stuff up online they are yelling the letters A, B & S. I definitely had fun working on this build and I'm fairly pleased with the presentation of the final product. I felt that the end result was fairly unique. Mark Erickson - Apocalyptic Roadster. My favorite creation I made for the round would definitely be the Apocalyptic Roadster. I rarely build non-minifigure scale builds so it was a refreshing break from my usual landscape crawling with brawling figures. I also think it was one of my best uses of the seed part. And despite using it 52 times it doesn't seem terribly out of place! David Zambito - At the Aquarium. At the Aquarium was most involved of the builds from beginning to end. I decided early on, while going through other silver pieces, that I wanted to do a build using the seed parts and some 1x1 cones as fish. I also wanted to use the green sprue as seaweed, and I played around with those two ideas throughout most of the competition, never making something I was especially happy with. Finally when time was running out, I decided to try fitting everything in a smaller area than I had originally planned (I had tried several layouts in a more open water environment), and had the idea of doing a large aquarium with some people looking in. Since the layout came together really quickly, I decided to try using the chalice as another form of marine life, and came up with the octopus on my first try. All in all I was happy with how this build came out, as well as how well it photographed. Sam J.J. - Bedside. This was a very fun contest, although I was unable to build for most of it. The second build I did was a bedroom. I had to build most of it on the last day of the contest so I was coming up with ideas on the fly. I had wanted to build a lamp as soon as I opened the package, so I figured a bedroom would work well. I used the piece in the bed, a lava lamp, a lamp, a trophy, a baseball bat, and a microphone. I was really short on time so the build ended up being not too colorful. I would like to thank my teammates for producing some great builds that kept our team alive! I would also like to thank my opponents for building some amazing mocs and putting on a great show. Thank you to the judges and others who made this challenge possible and I can't wait to see what the future has in store. Thank you! Mark of Siloam - Calvin and Hobbes. The inspiration for this build will be pretty obvious to many people. I received the entire Calvin and Hobbes comic collection for Christmas and was reading my way through it when I opened the piece. A couple different uses came to mind, but I thought binoculars the best- plus, the eyes fit perfectly at the end! I thought the brick-built figures were going to be the hardest part, but other than having few orange pieces besides 1x1s, they went together smoothly. Andrew JN - Frankenstein's Monster. First, a thank you to all the ABS judges for the opportunity to participate, as well as the time you spent organizing and judging the ABS Season 2 Finale. I had a lot of fun, although I wish I put more effort into the contest. I really enjoyed seeing all the creativity from others, and their utilization of the seed part. The Frankenstein's Monster build was one of the first ideas I had for this contest. The idea came about when I put two chalices together, and that instantly brought to mind the famed metallic bars on either side of the monster's neck. After that, I knew I wanted the bust to be in the style of Tyler's, and so I drew a lot of inspiration from him. I added the stickers (purist of course, from a LEGO sticker sheet) at the very end, and that small detail really added a lot to the bust and was the "icing on the cake" for me. We want to thank this round's sponsors once again - be sure to visit their stores when looking for cool pieces to add to your collections! To view all of the creations built for this finale round, visit the Flickr thread where we hosted the competition. 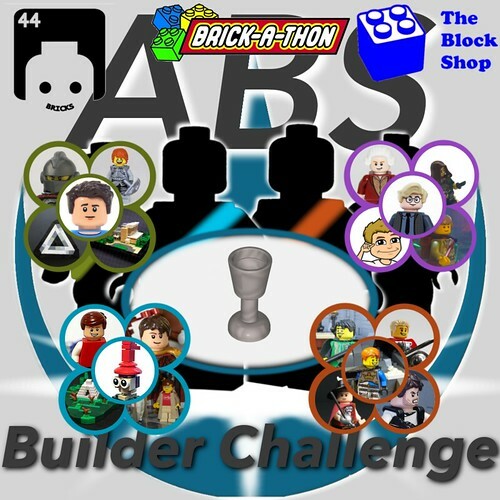 If you want in on season 3 of ABS Builder Challenge, go to the Flickr group's application's thread. We'll be back with ABS Builder Challenge season 3 later this year or early next year with a couple of changes. We've got a couple of other projects that we're working on, including an update to our website, so stay tuned for those. Meanwhile, be on the lookout for the Summer Joust and the Colossal Battle Contest competitions later this summer. The standard format of the challenge, however, is not changing. It's still 4 Competitors, 2 Weeks, 1 Unique Piece. This has been ABS Builder Challenge Season 2, and we'll be looking forward to the next season!